Give a beautiful ham an equally delicious glaze in our Ham with Walnut Glaze. 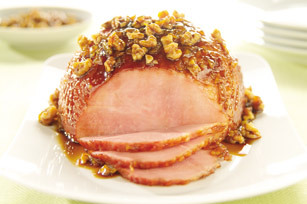 We love Ham with Walnut Glaze, made with orange marmalade & toasted walnuts. Mix marmalade, soy sauce and sugar. Reserve 1/4 cup for brushing onto ham. Bake ham as directed on label, brushing with reserved marmalade mixture the last 20 min. Meanwhile, bring remaining marmalade mixture to boil in saucepan on medium heat, stirring occasionally. Stir in nuts. Slice ham. Serve with marmalade sauce. Heat oven to 350ºF. Spread nuts onto baking sheet. Bake 5 to 7 min. or until lightly toasted.